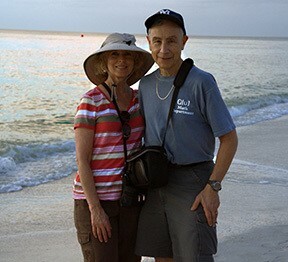 My wife Tara and I were vacationing in Naples a week before Christmas. We love to walk on our favorite beach there. It was two days (not the night) before Christmas when, during a morning walk on the beach, I accidentally stepped on the words Merry Christmas made in the sand. The woman who was constructing the words shouted watch out but it was too late. I destroyed some of her pretty artwork. I apologized and Tara and I kept walking on the beach. At that point I never looked at the woman. My wife loves to take pictures as we walk. Further down the beach a woman saw her taking a picture of me and offered to take our picture together. She did and we thanked her. At that point I introduced my wife and I to her and her husband. Their names were Steve and Kris. He was a principal and she was a teacher. They both were on vacation from Minnesota and had two sons with them. We started talking and as expected I began talking about baseball and they both said they were huge Minnesota Twins fans. I gave them my card and suggested they go to my website www.sandlotstats.com and also visit my baseball blog. After our brief conversation with them we continued to walk on and expected never to see these two sweet people again. But the story did not end there. 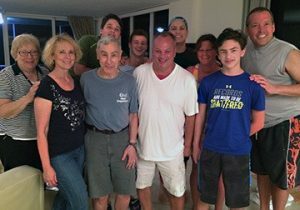 It was 4 PM on the following day when I received an email from the woman, Kris, whom we met on the beach asking if we would like to join them for dinner at their rental condo to meet their friends from Minnesota whose husband is very interested in baseball. I called her back at 4:30 PM and told her we would love to join them. Normally, I do nothing on the spur of the moment but this day was different and we accepted their invitation. She asked if we like tacos and we said yes. It was now 5 PM. Tara and I hopped into our car and in 20 minutes arrived in the lobby of their building. Her husband Steve met us in the lobby and escorted us to their apartment. Tara and I were introduced to Scott and Sue, their friends from Minnesota. Scott told me he did a weekly baseball podcast program with his son. 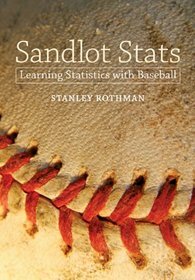 He said he had over 5,000 listeners and believed they would be interested in hearing how I used baseball to teach statistics at Quinnipiac. His podcast program is called, Apples 2 Apples. The six of us sat on the balcony which overlooked the Gulf as the sun set. It was postcard beautiful. Yes, Naples is paradise. I spent the rest of the time talking to Scott about various baseball issues. We both agreed that Pete Rose should be in the Hall of Fame. He said what I have said many times that Rose should be judged on his baseball accomplishments only. We all know that there are members of the Hall who did far worse things than bet on baseball. We both cited Ty Cobb as an example. He told me how beautiful the new Minnesota Stadium was. It turned out he was staying on the East Coast and so at about 8 PM the party ended and Tara and I and Scott and Sue left together. Before leaving I gave Scott my business card and he said he would be in touch with me about my appearance on his show. Stay tuned as I will recount my experience after I appear on his show. Here is where the funny twist to the story comes in. Remember, I said earlier how I stepped on this woman’s Merry Christmas sign in the sand. Well it turned out the woman was none other than the same woman who took our picture and invited us to diner. Yes, it was Kris. As I have said many times before, BASEBALL DOES FOLLOW ME WHEREVER I GO.